Yes, you can do this with a whole chicken, however, there is something I really enjoy about having a dinner party where everyone gets their own ridiculously adorable (and delicious) hen. 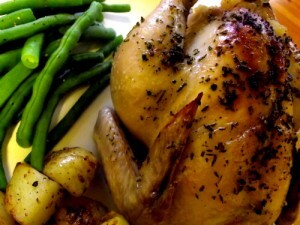 If you’re using a whole chicken, increase the ingredients by half and increase the covered cooking time. 1/2 tsp smoked paprika **optional** I like to add it to enhance the smokiness of the bacon. Preheat oven to 350. Saute the onions on medium heat in tbsp butter and splash of oil until they begin to become transparent. Add sliced bacon and continue cooking until it’s crispy. Add apple, garlic, and rosemary and saute for 2 minutes. Add chicken stock and and simmer for 5 minutes. Now add bread crumbs and mix together well. Rinse hens and then carefully fill cavity with stuffing. Season top of hens with remaining butter,salt, pepper, and remaining rosemary. Cook covered with foil for 30 minutes, uncover and baste and then cook for an additional 10 minutes to brown and crisp skin. Whether using whole chicken or Cornish game hens, juice from the thickest part of the thigh should run clear. Any Additional stuffing can be cooked in a separate and covered oven safe dish with a splash of chicken sauce as it won’t get the extra moisture from inside the bird.